Did You Listen . . . and Understand? Effective communication requires active listening — and much more. Over the past few weeks our family has been struggling with concerns about the treatment someone received at a large medical facility. Dozens of people beyond the patient have been involved — family members, physician’s assistants, doctors, pharmacists, nurses, patient advocates, physical therapists and others. Needless to say, the situation has been rife with chances for communications breakdowns — and we’ve had some doozies. Many of the breakdowns occurred because family members assumed that they had been heard and understood, and therefore medical personnel would act accordingly . . . but that was a wrong assumption. Are You Listening . . . and Understanding? No matter your job or industry — health care provider or professional communicator like me — we all face communication challenges every day. If I’m engaged in conversation and I don’t employ active listening skills, chances are our discussion can quickly go off the rails. Hearing them without getting defensive; listening to learn/understand. Verifying that all parties are operating off the same information. Summarizing and paraphrasing back what you have heard. Thanking them for bringing the concerns/issues to your attention. Appropriately responding to those concerns/issues. Store To Door drivers deliver groceries to seniors who can’t get out to shop. As soon as each driver steps in the door, he’s listening and observing closely, watching out for any changes in the senior’s needs and creating a personal connection that contributes to her well-being. The staff members at CornerHouse (which I wrote about in my last post), embrace listening as part of their mission: To assure that the voices of children and adolescents are heard, in cases of sexual abuse or violence. The Rainbow Research evaluation professionals have highly developed listening skills. They specialize in participatory methods and have a keen ability to engage with diverse audiences in culturally appropriate ways. 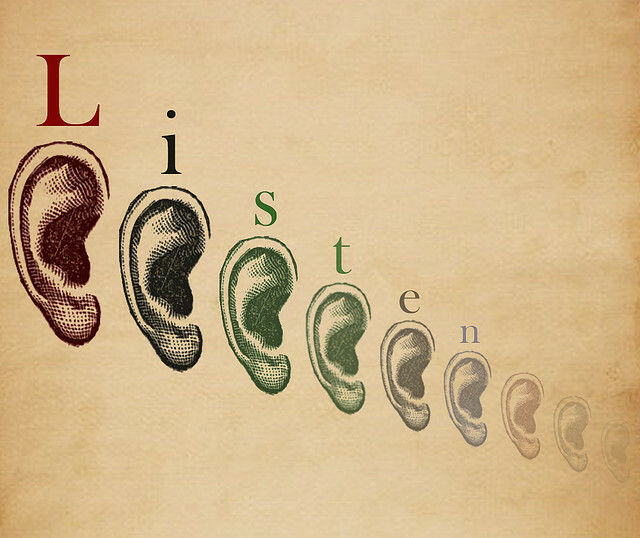 What Are Your Best Listening Strategies? What lessons on active listening and effective communications are you learning from your clients and colleagues? Do you have a personal trick to stay present in a conversation or to remember to be quiet and listen (like the old “one mouth, two ears” saying)? Let me know what works for you. I’ll be listening to — and really trying to understand — your comments.